A Molecular Conception of Organisms and Neoplasms is a six-chapter thesis that consists of a chain of reasoning on the theory of molecular conception. This thesis contends that any organism, even if multicellular, is basically a single molecule, which is the key problem of the causation of neoplasms. After providing a unifying definition of a molecule, this book goes on discussing the concept of fundamental unicellularity of multicellular organism through protoplasmic continuity between its cells. 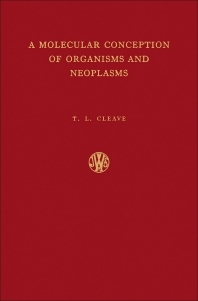 The succeeding chapters highlight the principles of the molecular conception of organisms and neoplasms. The final chapters outline the other activities of an organism determined by the molecular conception theory, such as embryonic development, animal heat, movement, pleasure and pain, and mind. This book will be of value to biochemists and clinical chemists.